An earlier card from my parents, this time with the Mum & Dad moniker. Taking full advantage of their retirement Mum & Dad travelled extensively, and to some extent continue to do so. Although these days the cost of insurance is often more than the trip cost, so this is a limiting factor for them. The picture is of Surprise View, probably the most iconic view of the Lake District and A&T are lucky enough to be enjoying some good weather during their visit to the area. The card is post marked ‘LANCASHIRE 13 OCT 2015’ and also carries the timely reminder to ‘REMEMBER TO USE THE POSTCODE’ – amazingly this is now four decades after postcodes became mandatory in the UK. Do we really still need reminding? A&T are my parents, but because the card is to all of us and we all call them different things (mum&dad, A&T, Nan&Grandpa) my Mum has chosen the A&T moniker on this occasion. 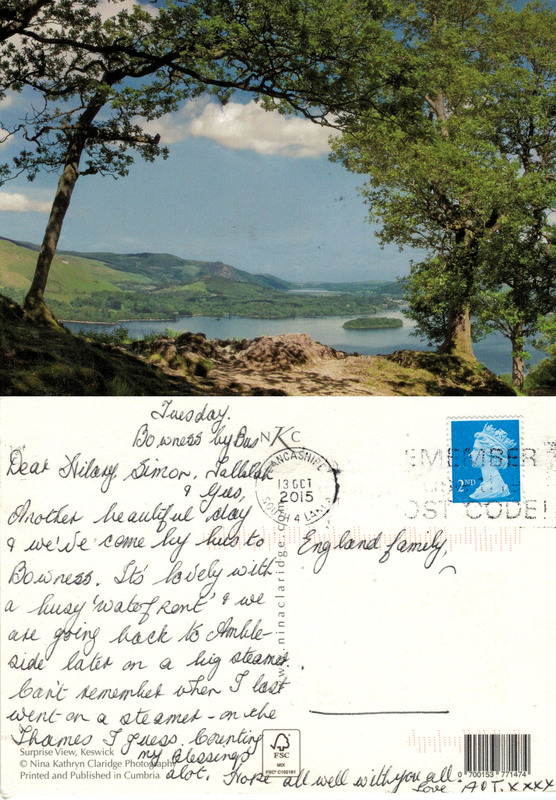 As a child I enjoyed many family holidays in Cumbria, and this card brings back happy memories: long summer days, camping, sailing, messing about in streams, climbing mountains… As I mentioned last time, I feel very lucky to have both my own parents still alive and my in-laws, healthy and happily married – in both cases for 58 years! A status update containing a tantalising hint at a much more interesting back story too long to include on the postcard! There is, however, room for a brief comment on the weather. 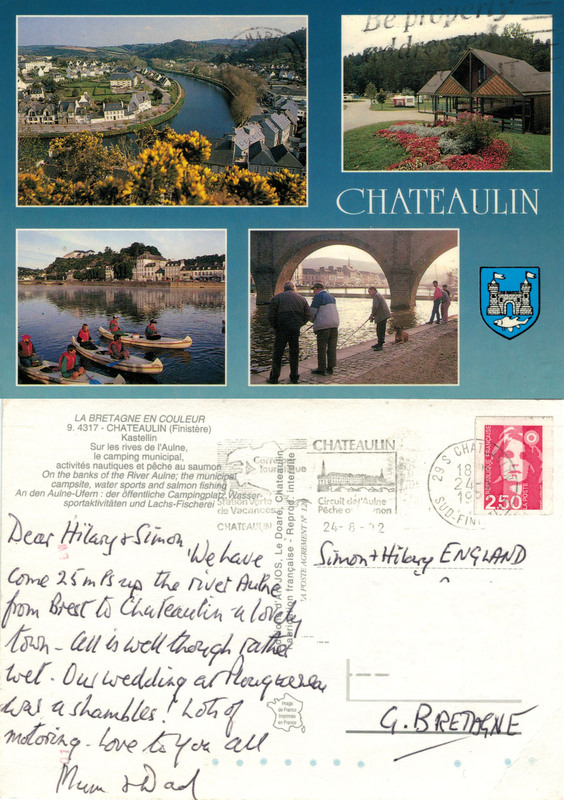 The card carries a 2 franc 50 centime stamp and is postmarked ‘CHATEAULIN 18H 24-8-1992 SUD-FINISTERE’. There is a further postmark promoting the area as a ‘Carrefour Touristique’ or tourist hub and a ‘green holiday resort’. 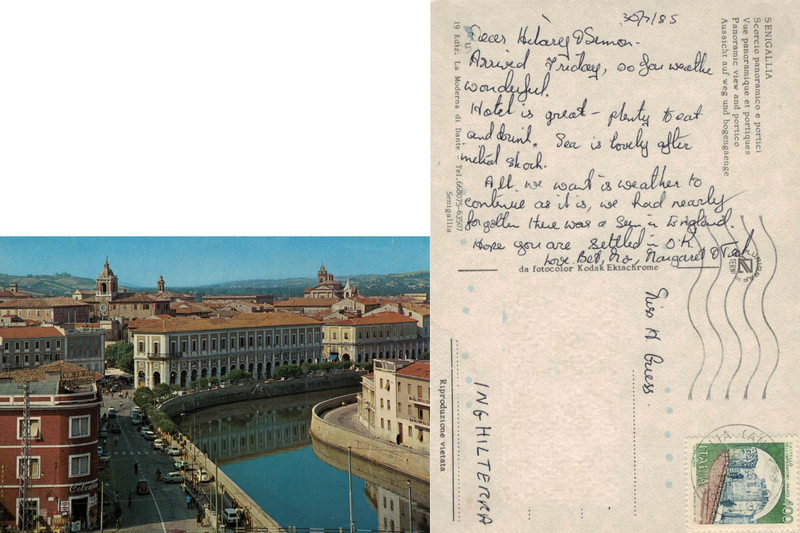 This postmark also includes a map (which could be anywhere) and a picture of the town with its, no doubt famous, bridge. In addition, the postmark mentions the ‘Circuit de l’Aulne’ cycle race as well as ‘Pèche au Saumon’ salmon fishing. What a wealth of information contained within a space that is 2 inches by 1 inch! 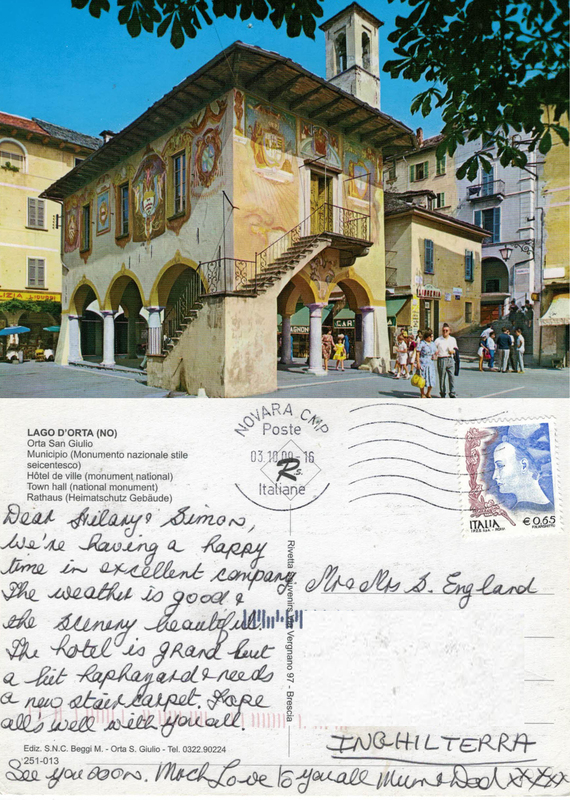 The front of the card is spoiled by the UK postmark which is dated Chard 27th August 1992, presumably the sorting office for mail from France. The old favourite ‘Be properly addressed’ and ‘POSTCODE IT’ is also there – nearly two decades after postcodes became mandatory! This ‘Mum and Dad’ are my in-laws, and the card is written by Dad. Over the years they have enjoyed many holidays in France and have a great number of friends there who they continue to visit regularly. I feel very lucky to have both my in-laws and my own parents still alive, healthy and happily married – in both cases for 58 years!